§ ePOWER4803C and ePOWER4803E are integrated golf car battery systems with a 48V 3KWh Lithium Ion battery pack. The battery configuration is a 16s1p 60Ah pack. It is typically programmed with 80%DOD, or 2.4KWh usable storage capacity. ePOWER4803E system fits in EZ-GO golf cars and ePOWER4803C fits in Club Car golf cartsA battery management system, control circuits and a battery charger are included. It is simple to install and use. It includes an On/Off switch, a state-of-charge (SOC) gauge, a DC main power connector, an AC power input socket, as well as a video output port for diagnostics. 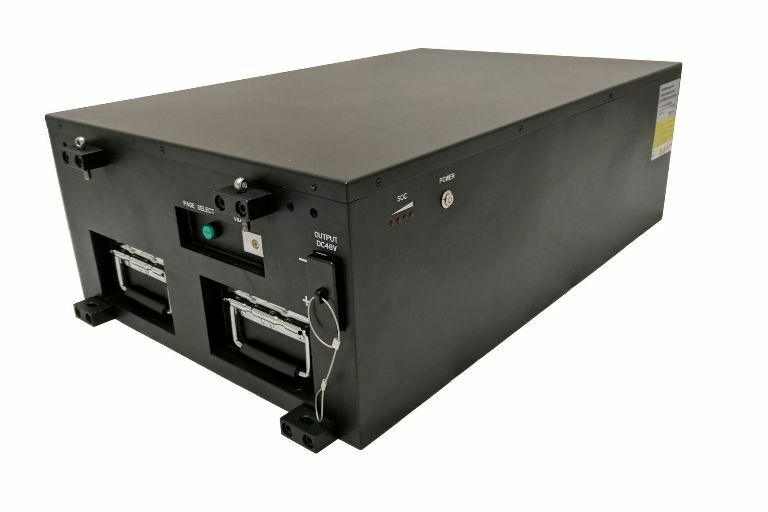 § ePOWER4810 is an integrated energy storage system with a 48V 10KWh Lithium Ion battery pack. The battery configuration is a 16s2p 100Ah pack. It is typically programmed with 80%DOD, or 8KWh usable storage capacity. Multiple units can be put in parallel to add more capacity. A battery management system and control circuits are included. It is simple to install and use. It includes an On/Off switch, a state-of-charge (SOC) indicator, a DC main power connector, as well as a video output port for diagnostics. Dimensions: 32 7/8” (L) x 20 7/8” (W) x 10 ¾” (H); Weight: 294 lbs. ePOWER1201 is an integrated battery systems with a 12V 1.2KWh Lithium Ion battery pack. The battery configuration is a 4s1p 100Ah pack. It is typically programmed with 80%DOD, or 0.9KWh usable storage capacity. A battery management system, control circuits, a battery charger, a solar charge controller and an inverter are included. It is portable and ideal for camping and tailgating. It includes an On/Off switch, a state-of-charge (SOC) gauge, two AC outlets, two USB ports, and a connection port for solar panel. The AC outlet provides pure sine wave AC power with maximum continuous power of 1500W. The maximum power of solar charge controller is 200W. Dimensions: 17 15/16" (L) x 13 1/8" (W) x 16 3/4" (H); Weight: 64 lbs.